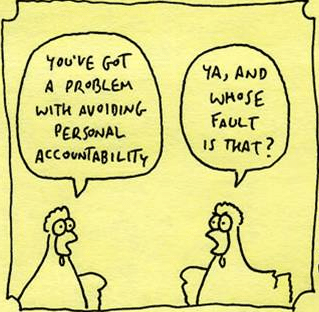 Personal Accountability – How do you rate? People being accountable rates as one of the most important development outcomes in the work we do with organisations. Its importance to business results cannot be overstated as it underpins both personal and organisational effectiveness. In his book on Accountability: The key to driving a high performance culture, Greg Bustin says “ If accountability is so important, why do so many leaders struggle with it?”. Most people acknowledge that being accountable is one of the most important competencies for a leader, however, when it comes down to managing accountable behaviour reliably, many people come up short, instead preferring to give justifications and excuses for why they didn’t get something done as agreed. 1. I keep my promises and agreements. 2. I know what I am accountable for in my role and have a plan for meeting agreed goals/KPI’s. 3. When required, I have difficult and uncomfortable conversations. 4. I do not put off difficult tasks. 5. I speak up when I don’t agree with something. 6. I am on time to meetings. 7. I actively contribute in meetings to forward the meeting’s purpose. 8. I clearly communicate my expectations of others. 9. I have ample time in my week to do forward/future planning. 10. I delegate effectively i.e. what I delegate to others gets done to my satisfaction. You can increase your score by choosing one or more of the statements and behaving in ways that are more accountable. If you take this on, you will be more productive and others will observe the difference!